My name is Dan Funderburgh. I design wallpaper and make decorative art. Some of my wallpapers are in fancy hotels or legit museums. I live and work in Brooklyn but play soccer in Chinatown. Desk no.1 is in my house and shot from an angle to disguise the clutter. 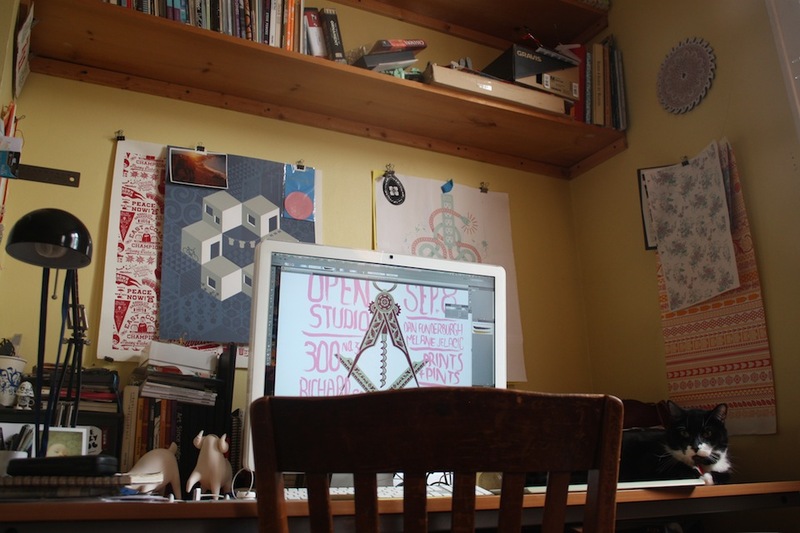 This is where I do most of the illustrating and emailing. I’m not sure what it says about me that most of the surfaces are covered by stuff that I made as opposed to work that could inspire me to make something better. I’m in the process of moving to the studio in order to make room for a baby bed so everything is kind of in transition. You can see some ceramic beasties that my sister Eva Funderburgh made and I was supposed to paint, but haven’t yet. Some day ! Also visible are some envelopes I’m collecting for an ongoing paper quilt project. My Cody Hudson mug is normally filled with black tea. 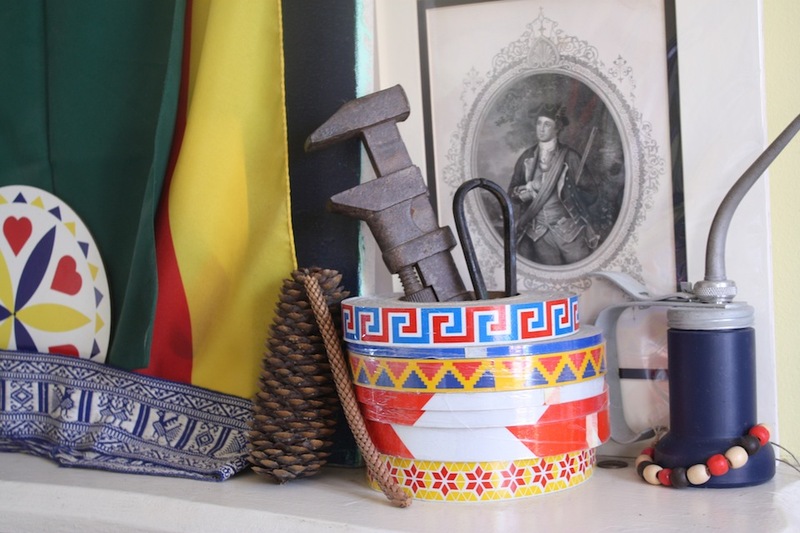 The mantle above that desk has flags and colorful knickknacks from all over. Those patterned cylinders are rolls of reflective vinyl tape from Cairo. The trucks have these awesome motifs detailing their back bumpers. The mean looking wrenches I found on the curb. 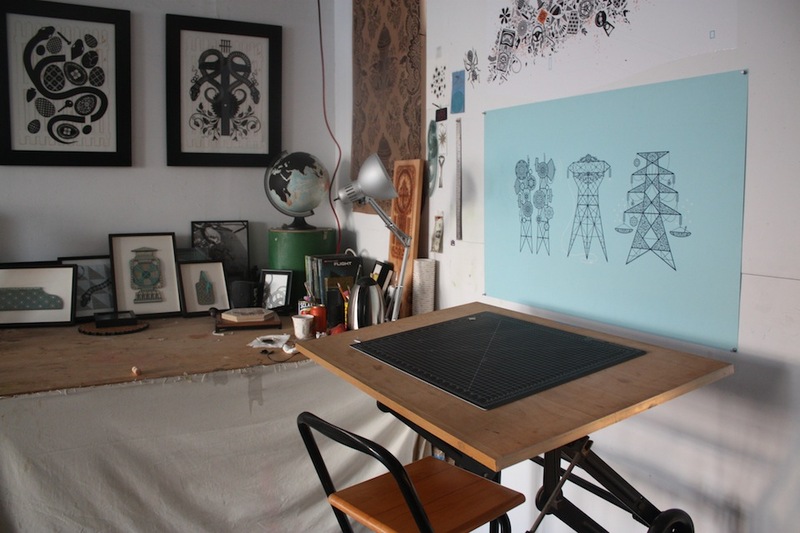 The second and third desk are in my studio in industrial northeast Brooklyn. 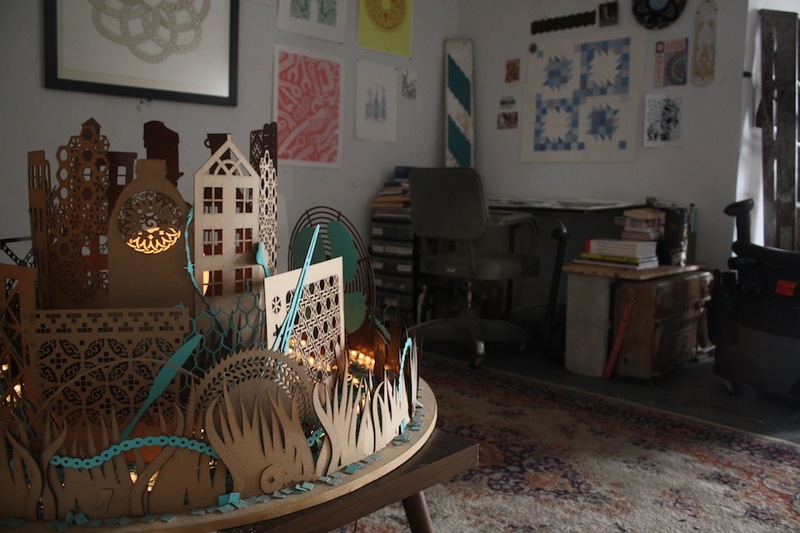 These desks I use for drawing, cutting paper, drinking, and basically pretending to be an artist. I really like it here. Dan Funderburgh is a Brooklyn-based illustrator, artist, and wallpaper designer whose creations are rooted in the world of decorative arts. Dan was born in Seattle and reared in the Midwest, receiving a BFA from the University of Kansas with a focus in illustration. 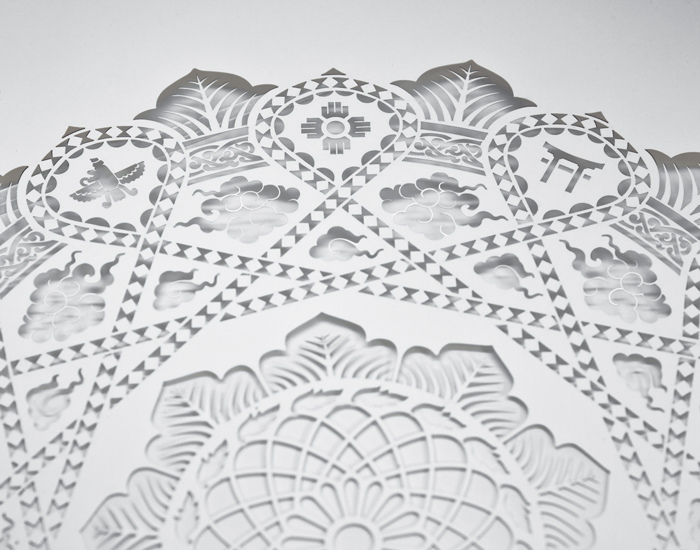 After moving to New York in 2001, Dan established a partnership with the now Brooklyn-based wallpaper studio Flavorpaper, where his designs are hand-screen printed. 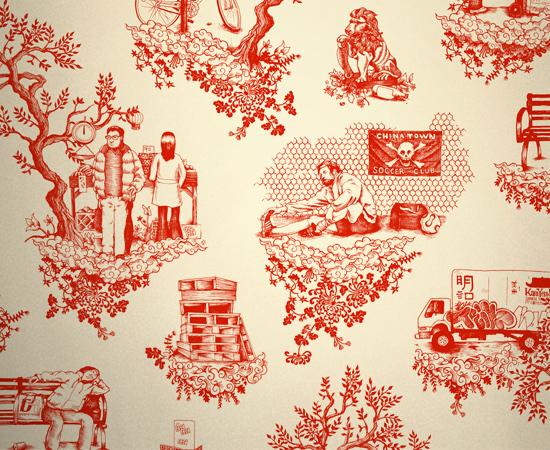 The wallpapers have been featured at the International Contemporary Furniture Fair and at Pulse Miami, and are a part of the Cooper-Hewitt’s permanent collection. Occasional collaborations with companies like Brooks, Furni, and Gravis have allowed the work to live on bicycle seats, furniture, and luggage. He currently lives and works in Brooklyn. DAN FUNDERBURGH: Fairly inefficiently I think. I’m inclined to want to dive into a project and start researching and drawing arabesques right away. I’m not necessarily inclined to read or respond to important emails. I can spend days and nights caressing minute details on an intricate pattern for a project that I would know had been canceled if I could be bothered to go through my inbox. 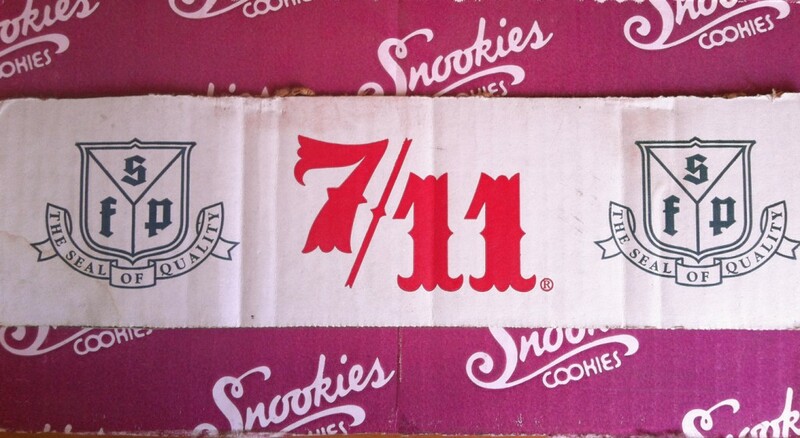 DF: I have an old piece of a cardboard box that says 7 to 11 on it. When I worked in-house at a t-shirt company, I kept this scrap to remind me of the personal projects I would get to work on when I went home at 7. Now it’s a reminder to appreciate time available for making what I want and keep it holy. 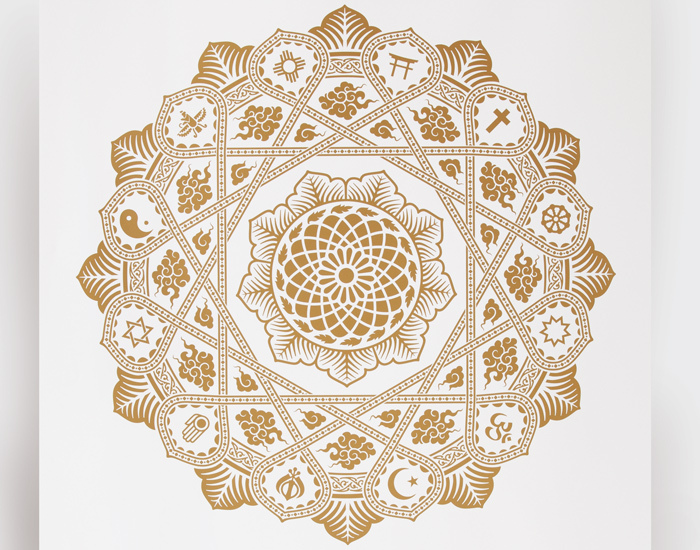 DF: A book called the The Grammar of Ornament by Owen Jones. It’s like cheating. Pretty much all the answers are in there. FYD: How do you approach pattern? DF: I can’t get enough of it ! I think the best approach is a historic pan-global maximalism where Scandinavian folk carving and minimal geometric op-art and Byzantine mosaic tiles work together to create something new and original. I could make some sort of analogy to a DJ finding and mixing forgotten records – but I think we’re all sort of tired of DJ analogies. FYD: What shapes attract you? DF: Ziggurats are pretty hot lately. 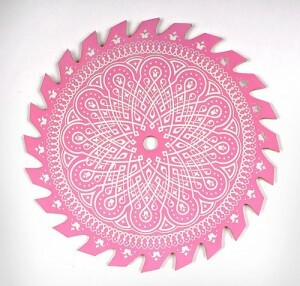 FYD: Your work draws on everyday items– tools, cameras, birds. 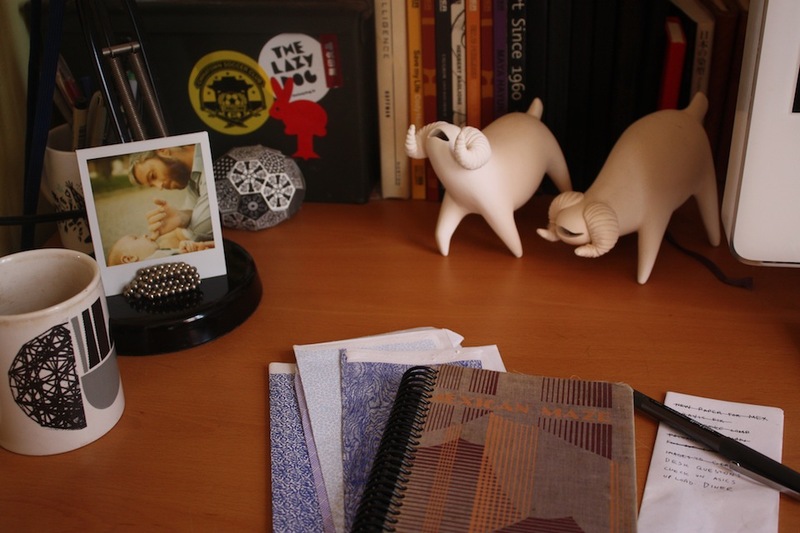 What do you like about ordinary objects? DF: I think embellishing everyday objects is a way to draw attention to the exceptional wealth of objects we are surrounded by. Beyond that I also have a formal appreciation for the shapes and curves found in utilitarian objects. Fan blades and lathes and rotary telephones – those sort of things. FYD: What do you love about wallpaper in general? DF: What I love about wallpaper is that my art takes over a space. This may have something to do with narcissism and my adolescent fascination with writing my name on dumpsters and walls. I think we’re all sort of tired of DJ analogies. FYD: With all the computer mumbo jumbo we all deal with on the day-to-day, how do you stay visually stimulated without feeling overwhelmed? DF: I think the key is just to accept this and channel this sense of the overwhelming. The Metropolitan Museum is overwhelming in the good sort of way. 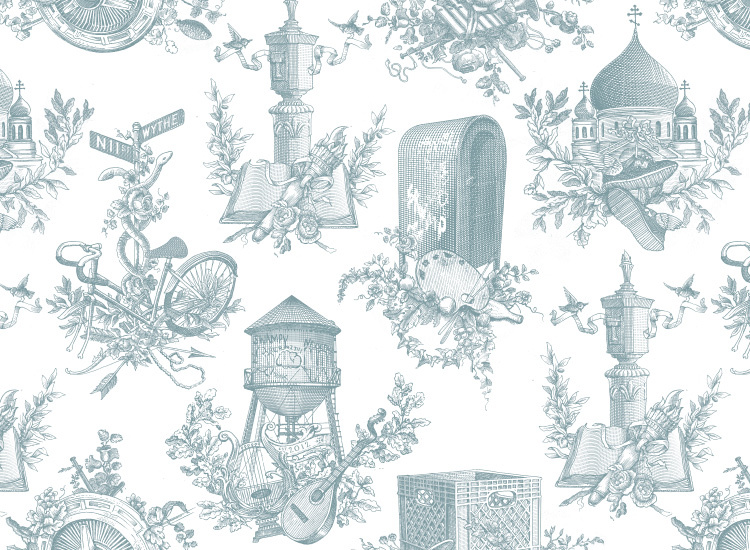 FYD: What was the notion behind your Posada Dumbo Toile? DF: That toile was commissioned by a restaurant in DUMBO, presumably if you’re eating at Gran Electric in Brooklyn you’ll recognize some of the local landmarks inhabited by a crude approximation of José Posada‘s fantastic woodcuts. I lost a lot of sleep on this project trying to recreate his expressively janky illustration style. In a more perfect world I would have had another month to work on it and could have actually done some woodblock printing instead of Photoshop. I have a formal appreciation for the shapes and curves found in utilitarian objects. 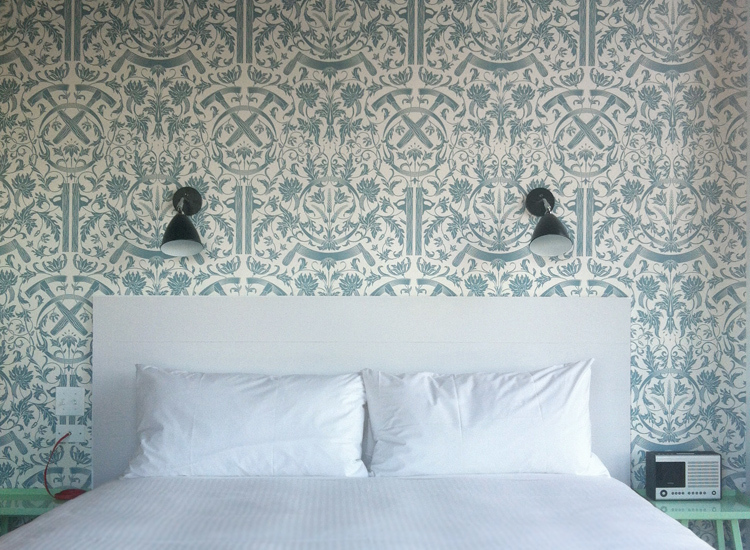 FYD: Any genre inspiration behind your three wallpapers for the Wythe Hotel? DF: The Wythe concept was to focus on the history of the building and the neighborhood. The building was initially built as a cooperage, so one design features barrel making tools. The genre isn’t precise, but it’s sort of a nod to William Morris with his botanical wallpapers as a proponent of the value of art and labor. 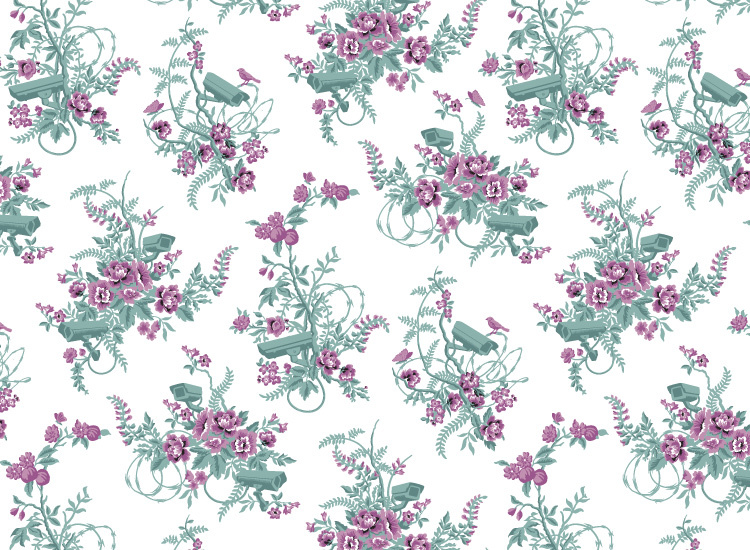 The Williamsburg Toile is an optimistic tribute to the surrounding environment. The church and the water tower are visible for people staying in the rooms and the toile motif and classical elements celebrate a contemporary renaissance of art and music in north Brooklyn. In the 40’s the building was a textile mill but switched to making ropes for the war effort so the third design is based on ropes and sailing knots. FYD: What do you love about collaborations? DF: I love when competent people can take something flat that I’ve designed on a computer and make it into something with depth and texture. Without collaborators I just make computer desktop wallpaper which is totally fine, but way less romantic. FYD: You are a Chinatown Soccer Club supporter and player. Talk about your love of the game. DF: I began playing with the Chinatown Soccer Club five years ago. I’ve become hopelessly addicted. On a rational career minded-level it’s completely ludicrous to spend so much time away from my family and unfinished projects to kick a ball around. On the other hand it’s really hard to overstate the good it does for my well-being. At least my mental well-being – physically it can be kind of taxing. FYD: Who is your favorite professional footie team? DF: Apart from the Chinatown Soccer Club I love to watch FC Barcelona. These are definitely the two strongest teams in recent history. FYD: What is your fall motto? Find Dan on Tumblr, Facebook and Flickr.